“Like an online dating service for design studios,” says Eric Bischof of the process his professor Anne Godfrey used to put together his project team at SUNY College of Environmental Science and Forestry. 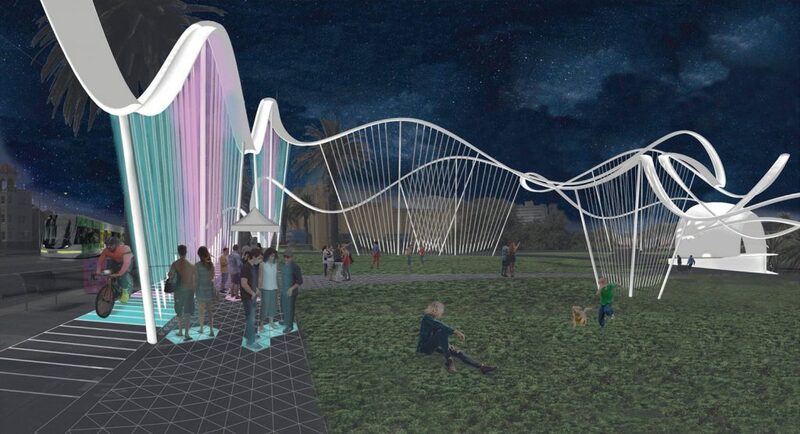 And the love shows in their resulting artwork Soundscape, a delightful piece that collects kinetic energy from wind and humans, and solar power. 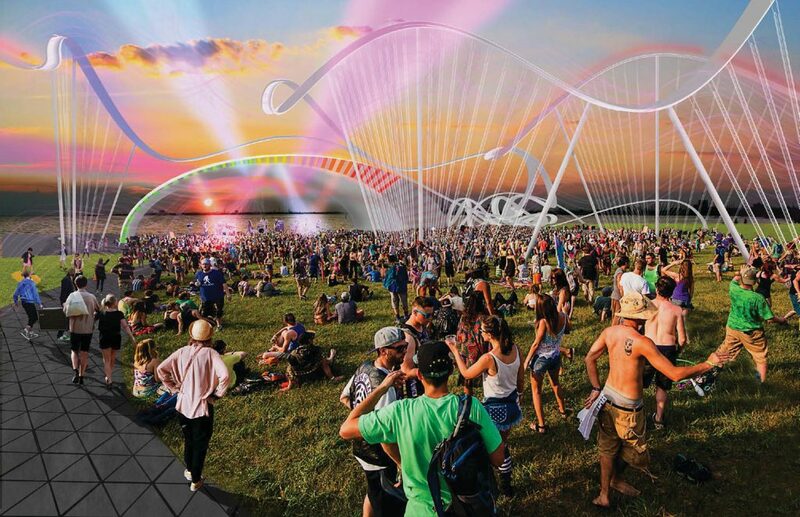 A multi-sensory celebration of art, music, and clean energy, the design was among 25 shortlisted in the 2018 Land Art Generator design competition for Melbourne. 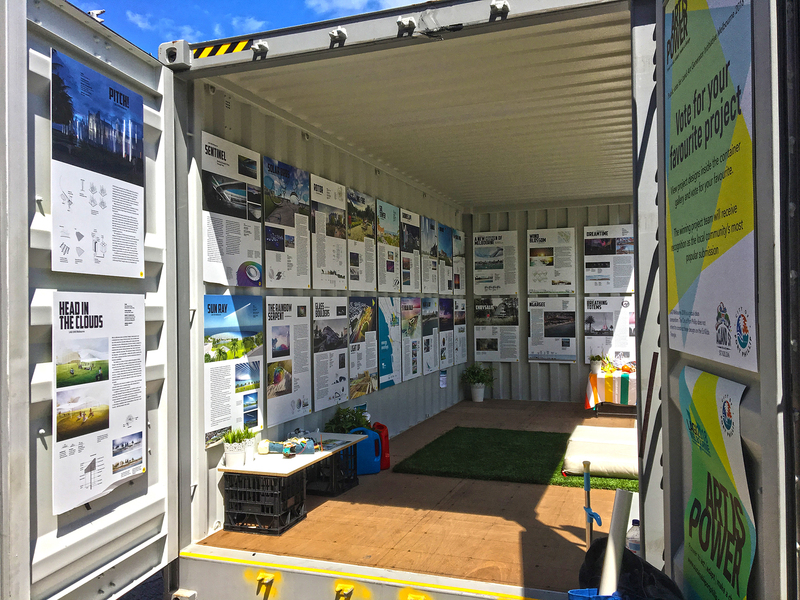 LAGI’s fifth biennial design competition called on global artists, architects, engineers, and landscape architects to submit proposals for regenerative artwork that would overlay an existing Masterplan developed by the City of Port Phillip and constituents. Jordan Pulling, Patrick Alexander, Ryan Mackerer, and Bischof didn’t hold back. One of their top concerns was to ensure that whatever they produced for St Kilda Triangle needed to match the character and history of the existing site, a seaside incubator since the 19th century of joy and creative expression. For inspiration the team turned to the Great Scenic Railway at nearby Luna Park, said to be the world’s oldest continually operating rollercoaster. Their meandering “Wave” structure, which is visible from Port Philip Bay, matches that of the rollercoaster both in length and in form. Windbelt™ generators placed between the main structural columns that support the Wave use aerostatic flutter from the wind to oscillate magnets within a magnetic field, inducing electrical current. Thin-film photovoltaics placed along its entire length are also incorporated into the top of the “Acoustic Shell”. 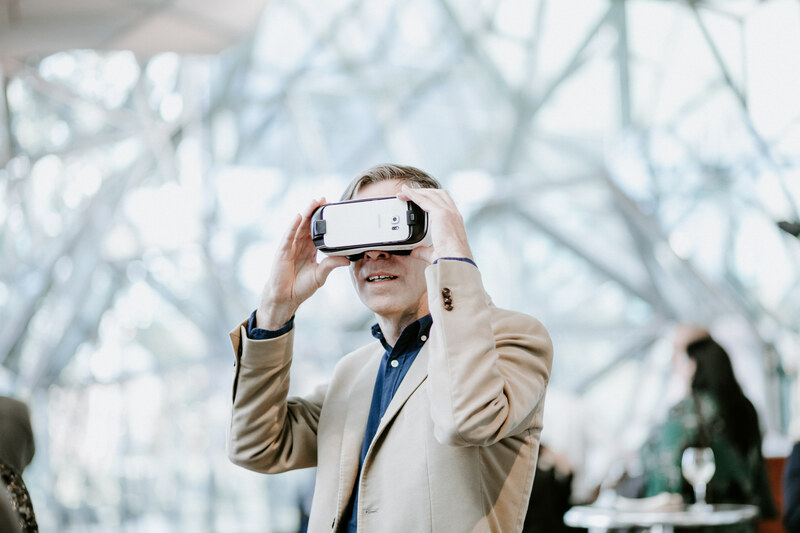 Visitors experience first-hand the power of a footstep and the energy potential of a single concert. While dancing, jumping, and moving on Soundscape visitors see their movement come to light before their eyes on the Acoustic Shell sound stage, along the length of the Wave, and below their feet along the “Power Paver” walkways. Entertainment and energy are intertwined, making the invisible visible and turning light into music. 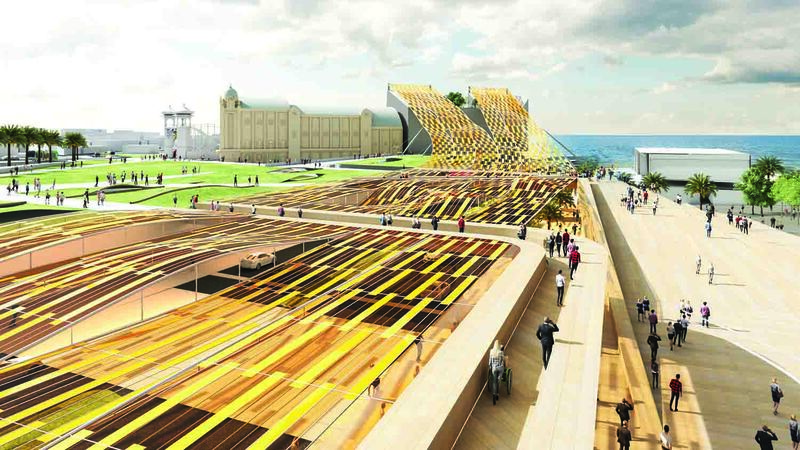 Further boosting their design’s energy generation capability, the team specifies 5,000 square meters of kinetic pavers which enlists human play in the quest to produce clean energy for St Kilda. The more people dance or run and jump around, the more energy they produce. For a sense of what that would look like, take a look at this Energy Floorvideo of people-power in action at the 2016 Rio Olympics. All told, the design can power itself and around 160 Australian homes. At night, it lights up like a beacon, amplifying its aesthetic appeal. LAGI Directors Elizabeth Monoian and Robert Ferry like the way the project engages visitors to the site. 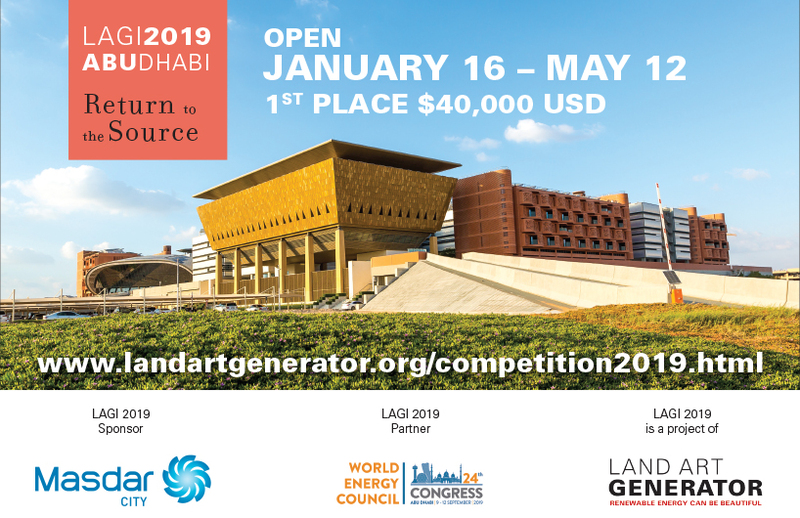 Creating an educational and playful platform through which every day citizens can learn about the future of renewable energy generation has always been a critical component of their competition design briefs. While one wouldn’t automatically associate renewable energy with landscape design, Bischof says they aren’t mutually exclusive. He is especially interested in brownfield redevelopment, clearing sites that have been polluted with industrial waste and other pollutants. Overlaying a renewable energy design could potentially cancel out the environmental harm, he says. And while massive wind turbines should stay out in the country or offshore, he says, renewable energy technology could easily be implemented to complement a masterplanning phase for a park, for a streetscape, or for anywhere, really. Google autocomplete is not helping our clean energy transition.